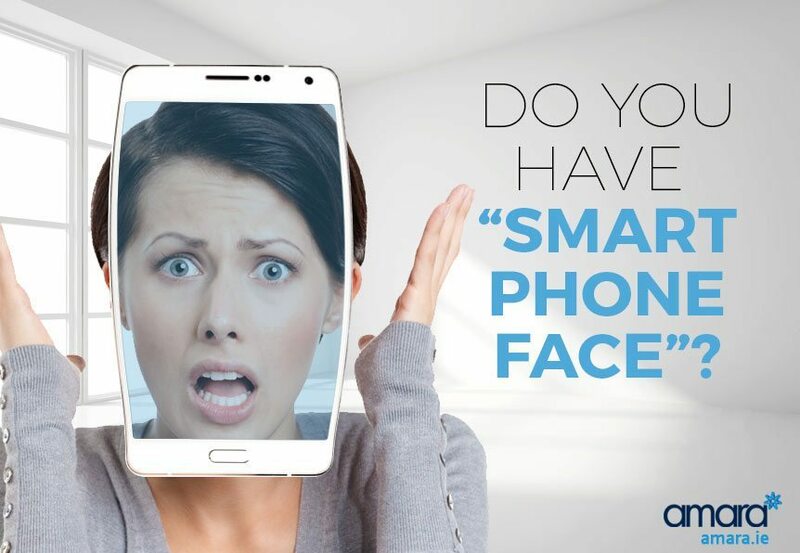 Do You Have Smart Phone Face? Do You Have ‘Smart Phone Face’? We’re addicted to our smart phones and taking selfies, so much so that the phrase ‘smart phone face‘ has been coined but are smart phones ageing our face?! How Do Our phones Cause Tired Eyes & Wrinkles? Aside from just gravity taking hold the blue light our phone and screens emit is very harmful to our skin! The rays mimic the sun’s UV rays and alter our bodies natural cycle preventing us from falling into a natural sleep. Unlike the sun’s UV rays the blue light emits no obvious symptoms such as sunburn. ‘Digital eye strain’ which can damage our retinas, is a leading cause for headaches and fatigue in many people. Headaches can lead to us tensing up our face and frowning which again all leads to wrinkles. How does Blue Light Cause Ageing? Long term exposure to blue light causes collagen breakdown leading to drooping, dehydrated skin, wrinkles and skin pigmentation. It’s one of the reasons why taking selfies can age us! 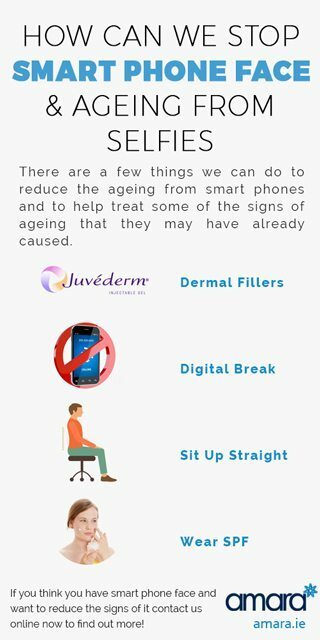 There are a few things we can do to reduce the ageing from smart phones and to help treat some of the signs of ageing that they may have already caused. For starters many of us already have sagging skin and tense muscles from our phones. We can improve the damage from this with dermal fillers. By injecting filler into our face we can improve the lost thickness and make our skin look more youthful. Botox can also be used to improve the frown lines or the tensed muscles in between our eyes. We need to give ourselves a ‘Digital Break’ – no phones, no TV and no screens of any kind. Many of us a use a screen non stop for our work, travelling and on our way home. Taking breaks will not only help our eyes but our posture as well. Constantly tilting and bending over is wreaking havoc on our posture which in turn is causing our face to sag. Sit up straight when you are working and when possible have your chin tilted up slightly. This is something I drum on about constantly, even when it is not shining the UV rays still penetrate the clouds and our skin causing damage and ageing. Many people use SPF as part of their daily routine so they have already taken a step to protect themselves from the Blue Light damage. Use a high SPF such as ZO Skin Health Smart Tone Broad Spectrum with SPF 50, in the morning before you apply your makeup and after you cleanse. This will help prevent the HEV lights from penetrating your skin preventing ageing. Do you have some of the symptoms mentioned above then you may already have ‘Smart Phone Face’. If so, we can help! Book in for your free consultation now to see what treatments are right for you! How do you dissolve lip fillers? How much is 1ml of Lip Filler? Why this is the wrong question to ask. Does a Skin Peel Suit acne? Dr Paul Munsanje Graduated from UCD in 2002. He has been performing injectable cosmetic treatments since his initial training in 2007.